While pedaling up and down and around getting exercise (and lowering blood pressure and other good things) I see things I would never see, let alone notice, if I were driving. Cats...lots and lots of semi-feral (or really feral) cats, for instance. The two weeks when male tarantulas wandered the streets, looking for female tarantulas (who were down in their burrows, waiting...) Tarantulas around here aren't dangerous, just startling when something the size of my palm is trundling across the street. I am glad to say I didn't run over any of them. I see people, though not too many, and say Hi, and they look startled at first, and then smile. Few adults in this town ride a bike, and they don't all ride at the times I do, so I rarely get to see one. But I've gotten to know some people because after they see me a few times, they may ask how far I'm going, or why I'm riding a bike every day. Today's morning ride had some special surprises. For several days I'd wondered what strange bird was hanging around a particular house--I couldn't spot it, but I could sure hear it. I suspected it had gotten into that house's attic, but had no way to see. Today I found out that the strange birdlike noises were coming from an animal I had never associated with strange birdlike noises...when it started making additional noises that fit its reputation better. It was a very small pig in someone's fenced back yard. The yard fence runs alongside one of the streets where I ride. I don't have the picture of the pig; I don't carry a camera when I'm doing the daily miles. A few loops later, I turned at a corner where two vacant lots are diagonal from each other (houses on the other two corners.) And there, right in front of me in the middle of the street, was a roadrunner. Though roadrunners will run along in front of a slow car, or a tractor, or a pedestrian...apparently a person on a bicycle looks like a monster. Away it went into the nearer vacant lot, actually flying a few yards to get up speed. I like roadrunners, and we get them in the barn lot and out on the 80 acres, but I'd never seen one in town proper before. Here's a picture of one that hung around the barn and horse lots quite a bit in 2006. One afternoon I set up about 10 yards away with the big lens and got some great shots. I like bicycling. But where I live, I may as well paint a target on my back and carry a sign saying that I'm worth 50 points if hit. Sorry you're in that place, then, unless it's a place you really like. Oh - lovely! I do love pictures of American birds, as they are so very different to ours. 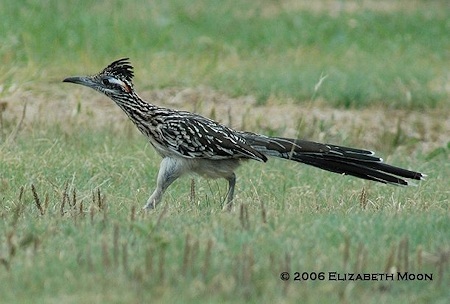 I always feel like my week is made when I see a roadrunner. The one that lives on our road in had a little snake yesterday. Hop it had a baby rattler! I'm feeling very protective of our western coachwhips. If it weren't so bloomin' hot, I'd be up at the corner of our land where, Richard discovered, the big hole now has a little railroad track like thing down in the bottom, aimed toward the highway, with some honkin' big auger sections up on top, ready to do the big bore under the highway.